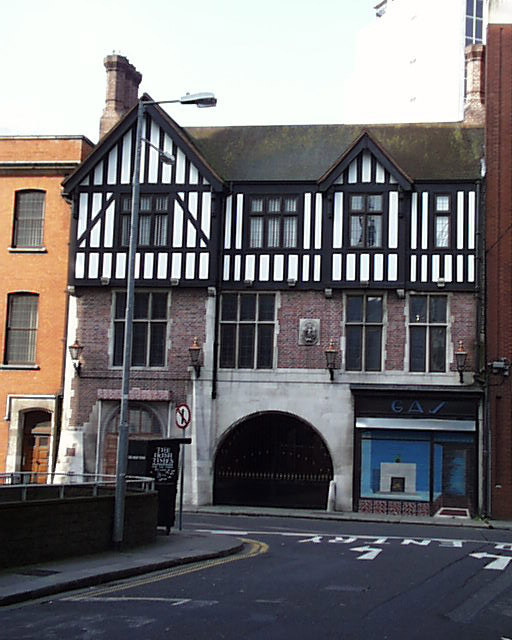 The former headquarters of the Dublin Gas Company (built in 1928) has two facades with two different architectural styles. The main facade onto D’Olier Street is Art Deco with a strong symmetry and shiny polished stone facing. The shop facade features a stepped low relief door surround while the upper lights of the windows all feature etched glass panels. Originally the upper windows had zig-zag motifs in the glazing bars but these have been removed and more modern frames inserted. The fine interior space still has Art Deco motifs visible mainly in the columns and ceiling details. The building has been well maintained with the large inset ‘Gas’ sign still illuminated at night. The rear onto Hawkins Street is a strange mixture of Arts and Crafts and English Tudor. While such an eclectic mixture of styles should not work, here it is does, perhaps due to the nature of the site in that the two facades neither meet nor can be seen at the same time.